Microsoft reveals Surface Hub 2S and Surface Hub 2X. Today Microsoft announce two new offerings in the Surface Hub family - Surface Hub 2S and Surface Hub 2X. 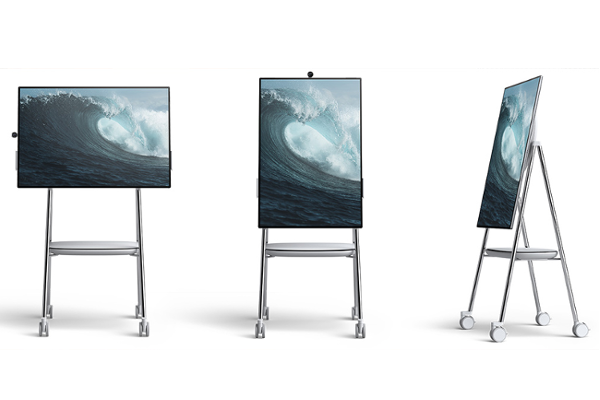 Surface Hub 2 devices are optimized for teams that want to connect, co-create, produce, and bring together the best of Microsoft collaboration tools - from Windows and Office to Microsoft Whiteboard and Microsoft Teams. Surface Hub 2 is lighter, sleeker, and more intuitive than its predecessor, all while being as easy to install as putting a TV on a wall. Paired with elegant mobile stands from Microsoft's partner Steelcase, Surface Hub 2 can be moved around the room with ease and anchored to a spot with a simple tap of your foot. In addition to having the convenience of being able to create an anytime, anywhere collaboration space with the transportable Surface Hub 2 stand you can effectively meet with teams from all over the world. If your colleague is hundreds or even thousands of miles away from you, they will feel like they're in the same room with Surface Hub 2. Meetings sound and look crystal clear in Microsoft Teams and Skype for Business with improved microphones, speakers, 4K camera, and true to scale video calling. Surface Hub 2 seamlessly integrates intuitive hardware, software, and modes of interaction to help people get in and stay in their flow. With the new Microsoft Whiteboard app, amazing features designed for large touch screens make you feel like you're at a real whiteboard, but with the added benefit of intelligent ink, the ability to find people, Bing search built in, image stacks, and more. Surface Hub 2 provides a robust whiteboard experience, but your whiteboard can be shared across Windows 10, iOS, and Android devices, so you can jump back into the same brainstorm session anytime, anywhere, from any device. Surface Hub 2S was built for users who still want the original Surface Hub experience that they know and have built for, but in a lighter, thinner, more vibrant design. With Surface Hub 2S users will be able to deploy either an on-premise or hybrid environment and keep the software experiences that they have standardized on with the original Surface Hub. Businesses can also now continue to use Skype for Business on their Surface Hub 2S or deploy the latest version of Microsoft Teams. Microsoft will release updates to the Surface Hub family in 2020 to enable customers to update to Surface Hub 2X. This includes the ability to tile, rotate, and enable multi user log in. This simple update is enabled by removable processor cartridges, in an easily accessible hardware chassis on the back of the Surface Hub 2. This processor cartridge can be removed, upgraded and serviced over time. The cartridge is what will enable customers to make the switch to the Microsoft 365 powered Surface Hub 2X in 2020. Surface Hub 2 starts to ship in Q2 2019.